Samsung churns out a constant supply of smartphones. So many devices have been released by the South Korean firm, in fact, that virtually every price point and tech. spec is now covered. 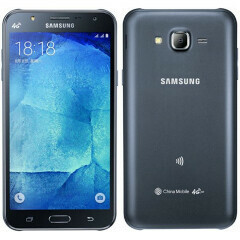 Last year, as you may recall, Sammy dropped the Galaxy J7, a handset that sought to take advantage of the Selfie Generation with its tailored front-facing camera complete with flash. Although said smartphone didn't arrive all that long ago, the 2016 upgrade beckons, and according to a new report, one version of the Samsung J7 (2016) will be powered by a previously unseen processor. The original Galaxy J7, like so many devices in and around the upper echelons of Samsung's product line, is available with Qualcomm's Snapdragon SoC or the Tizen maker's own Exynos chipset, dependent on region. The newer J7 appears to be following the same pattern, but while the octa-core Snapdragon 615 is a processor with which most are well versed, the less familiar Exynos 7870 will grace the alternate variant. 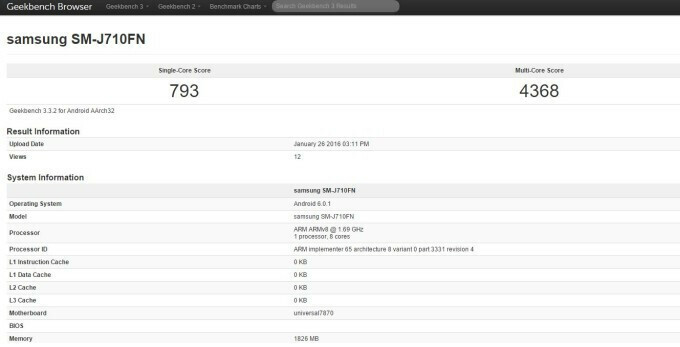 New info seen through Geekbench 3 pits the forthcoming J7, model number SM-J710FN, running the Exynos 7870. A jump up from the Exynos 7580, the octa-core 7870 clocks in at 1.7 GHz, which would place it at a similar performance level as the Snapdragon 615. Interestingly enough, the Exynos model shown through Geekbench only has 2 gigs of RAM, where the Snapdragon edition recently glimpsed through GFXBench had 3 GB. Encouragingly, the new benchmarks portray a device running Android 6.0.1 Marshmallow, meaning that prospective J7 owners can expect the latest installment of Google's software off the bat. The single and multi-core scores point to an incremental upgrade over the 7580. In short, the device still be a mid-ranger, but just a better mid-ranger than the original Galaxy J7. Nevertheless, with two strong cameras, a sizable 3000 mAh battery, a full-HD display and hopefully enough Marshmallow to go around, the refreshed Samsung J7 will continue to entice a market fixated with the selfie stick. Single core performance is more important. new midrange qualcom chip like sd 650 and 652 beat this exynos by far. Regarding exynos 7870, it is weaker than SD 652 in single core and powerful in multi core. Your use of the phrase 'by far is pointless as it both loses to each other and both has advantage over each other. Samsung probably will beat all other vendors with these budget devices if priced properly. Samsung must be coming for blood if indeed there's a 3GB RAM version. Samsung J7 do not has ambient light sensor. So that no automatically display brightness available. However if you want this function you can install "Auto brightness by PP" . It use camera to detect ambient light and auto adjust your display brightness.